Basketball power forward and defense specialist Daniel Theis is a German professional basketball player associated with the Boston Celtics of the National Basketball Association. He signed with the Celtics in 2017. Prior to his NBA career, Theis has played professionally for top clubs in the German Basketball Bundesliga including Brose Bamberg, Ratiopharm Ulm, New Yorker Phantoms Braunschweig, and SG Braunschweig. The amazing basketball prodigy has shown agility and resilience since the inception of his basketball career. He is a three-time German League Champion with the Bundesliga side, Brose Bamberg. He won the German League Best Defender following his brilliant performance in the 2017 season. In addition, Theis is a four-time All-Star from 2014 to 2017 and he was also named the Most Effective German Player in 2016. 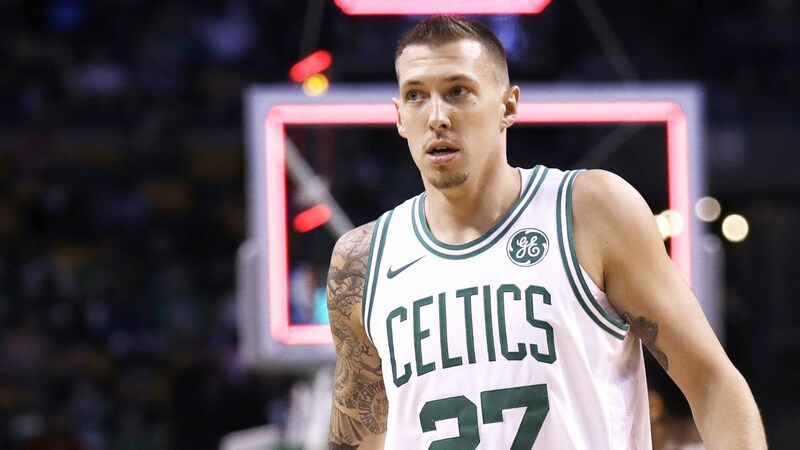 The basketball star was born Daniel Theis in Salzgitter, Germany on April 4, 1992. He came from an athletic family, his elder brother Frank also played basketball professionally in Germany. Daniel holds German nationality and belongs to the white ethnicity. Developing a strong passion for the game of basketball, the 6 feet 8 inches power forward started playing basketball from a very young age. As a teenager, he joined the Braunschweig youth basketball team in Germany. In 2009, Daniel Theis started playing for the SG Braunschweig club development team in the German Basketball Bundesliga. The following year, he won Eurobasket.com Most Improved Basketball Player of the Year Award. At the time, he was teammates with fellow NBA star Dennis Schroder. In 2013, he joined Ratiopharm Ulm club and during the 2014/15 season, he won the BBL Best Young Player Award. After an impressive season, Theis signed up with the Brose Bamberg club in 2014 and during the 2014 offseason; he played for the Washington Wizards in the NBA Summer League. Throughout his career with the Bamberg club, Daniel led the club to win the German League Championship for three times consecutively (2015, 2016, and 2017). He also led them to victory at the Berman Supercup championship in 2015; as well as German Cup in 2017. Theis was named German League All-Star for four times from 2014 to 2017 and in 2017; he won the league’s best defender. Following his breakout season with Brose Bamberg in 2017, Daniel Theis signed up with Bolton Celtics of the National Basketball League (NBA). He penned a two year deal with the Celtics in 2017. Playing alongside Kyrie Irvin, Theis averaged 4.3 rebounds and 5.3 points per game in his rookie season. Unfortunately, he sustained a knee injury in March 2018 during their game against Indiana Pacers; after undergoing an operation, he was ruled out for the rest of the season. Daniel Theis came from a caring and supportive German family. Although there is no much information about his family, parents, and siblings; we are able to gather that his father worked with Volkswagen. He also has an elder brother named Frank Theis. Just like Daniel, Frank also played basketball professionally before he retired. He is currently working as a middle school teacher in Germany. Surprisingly, his brother Frank has always had the dreams of playing in the NBA and while he was growing up in Salzgitter, he decorated his bedroom with the Chicago Bulls posters as he was aspiring to be like Michael Jordan. Daniel, on the other hand, had a passion for soccer before his father convinced him to join his brother in basketball. The two brothers played together for the Wolfenbuttel Dukes of the German Basketball Second-division. Frank’s career abruptly came to an end following knee injuries and age while Daniel has become the superstar in the family. While he is enjoying a blossoming career, Daniel Theis is also a happily married man and he has a daughter. He moved to the United States with his wife Lena and their daughter Laila Theis. There is no much information about his wife and daughter as he likes keeping his personal life and family away from the limelight to avoid unnecessary media attention. He is good friends with his teammates Gordon Hayward and Aaron Baynes. Interestingly, their friendship extends off the court. His friendship with Hayward and Baynes has helped Theis and his family to adapt to the American style of life. Height: How Tall is Daniel Theis? Daniel Theis has been outstanding in his basketball career, his resilience and great balling skills have brought him to the NBA to play alongside the big boys. His great physique and well-built body structure have contributed to his massive successes in the court. In addition, the basketball star is very tall, standing at a height of 6 feet 8 inches (2.06 m) and has a body weight of 110 kg (243 lbs). His hair is black in colour while his eyes are brown.